I really can’t think of a better word to describe Boboquivari’s(affectionately known as Bobo’s to San Franciscans) than simply that the restaurant is… Wow. Chef Andrea Froncillo, the magician and proprietor of Bobo’s, really puts his own stamp on an institution that is not only delicious, but unique. By integrating Italian cooking techniques, ingredients and preparation while also infusing it with some San Franciscan flare, Bobo’s is an institution that is quintessentially San Francisco. While Bobo’s is known for its food, friendly staff and unique ambience, Bobo’s original goal is to create a restaurant that is a destination rather than just be a place for food. Certainly, our experience makes us believe that this ethos still permeates across the entire place. With a convenient location at the corner of Lombard Street and Van Ness Avenue and the adjoining Bobo’s Lounge right next door, there is something for everyone at Bobo’s. For this meal, I was joined by Jason Nicosia of the The Perfect Steak. Together, we took in every nook and cranny that this restaurant has to offer, discussing everything from the perfectly cooked steak all the way to the otherwordly decor. Probably one of the most unique feature of Bobo’s is the circus-like theme that is evident outside and inside of the restaurant. The walls are decked out in red paint and a red velvet canopy hangs from the ceilings as you walk from room to room. I can’t help but feel like I was walking into the greatest show on earth, just like how I would feel had I been going to an actual circus. Frankly, I came into Bobo’s expecting that it would look like any high end, stodgy, cookie cutter, steak restaurant. Certainly I was wasn’t expecting a place with so much character and warmth. I was pleasantly surprised at this departure from the norm and it really shows that Bobo’s is carving out its own identity and niche in the city that is quirky in its own right. Well said chef, well said. When I asked many of my local friends on which restaurant serves the best steak in San Francisco, the one item that was consistently recommended was Bobo’s bone-in filet mignon. While filet mignons are a staple at any steakhouse, the uniqueness of a bone-in option is hard to come by in San Francisco. By leaving the bone on this beautiful 10 oz filet mignon, every bite releases a deep and wonderful beef flavor that coats the inside of your cheeks and lingers around your taste buds. My fellow reviewer, Jason Nicosia, describes the filet as “cotton candy” soft and indeed, each chew is effortless and juicy. Bobo’s “stash” of steaks are shipped in from Nebraska where the cattle are all grass fed, then corn fed for the last 6 weeks before they are slaughtered. Perhaps one of the prevailing signs of the intense focus on the preparation process is the slight crunch that I felt every time I bit into a new piece of meat. This crunch is achieved by the expert sear that is a result of rubbing salt onto the steak during the dry aging process and then pan searing it with butter when its ready to be served. The challenge that many restaurants face is determining the right amount of salt to use. Too much salt will envelop the taste of the meat and render it way too salty. Whereas too little salt will result in an uneven sear. It is art form that can only be achieved through years and years of experience and through vigorous bouts of trial-and-error. At $43.95 for this specific 10 oz. cut, this is one of the best and tastiest deals in town. Remember to get some sides as the steak is served ala carte. What caught my eye/ear during this dinner was the extra facet of creativity that Bobo’s injected into their food. For instance, one of my favorite dishes from this meal was the iron skillet roasted mussels. The mussels were roasted over a cast iron skillet(deeply seasoned no doubt) prepared Italian style with green onions, garlic, butter and olive oil all roasted over high heat. While this by itself is already awesomely delicious, the mussels were given a light dousing of soy sauce that sizzled and produced a fragrant smell that I couldn’t help but waft into my nose. It is refreshing to see the adaptation of a traditional Italian dish made with slant that is also distinctly Asian. 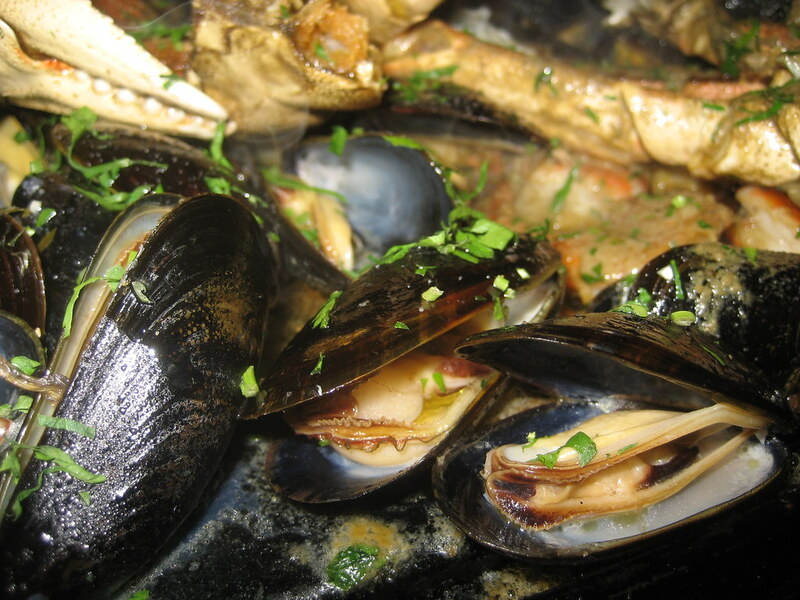 The soy sauce was an unexpected surprise but was a welcome addition that produced a savory element that actually heightened the taste of the mussels. At $16.95 for a single order, I can’t wait to go back and get some more! Regardless if you are a tourist or live in the Bay Area, you will not be disappointed by Bobo’s in any shape or form. For me, a sign of a great restaurant is the tenure of the wait staff. The length of tenure is a great indicator of the quality and the pride that the staff takes in being associated with the restaurant. We were fortunate to be taken care of by a gentlemen by the name of Teo, who has been at Bobo’s for 7 years and knows all the intricacies of the food as well as the history of Bobo’s. In short, the food is top notch, the steak is perfect and wine selection is ridiculously extensive. But don’t take my word for it. 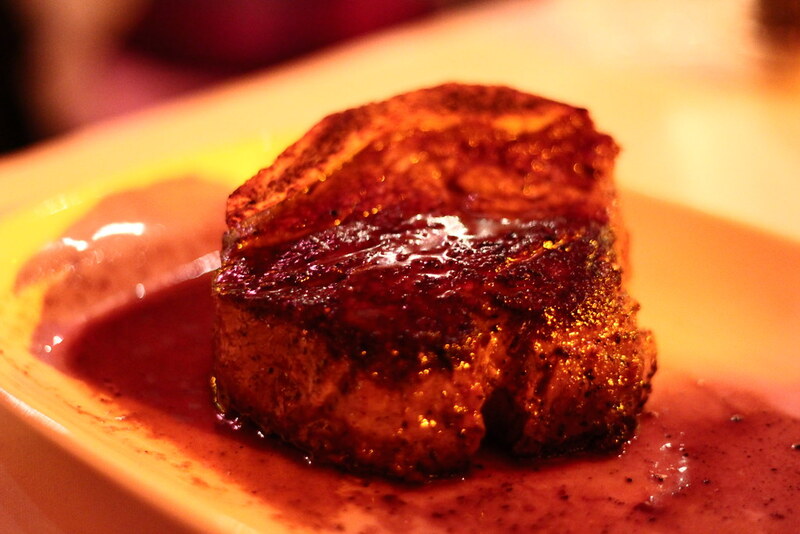 Check out Jason’s review over at The Perfect Steak and see what his thoughts are. You won’t be disappointed.